O God, strength of those who hope in you, who willed that the Bishop Saint John Chrysostom should be illustrious by his wonderful eloquence and his experience of suffering, grant us, we pray, that, instructed by his teachings, we may be strengthened through the example of his invincible patience. Through our Lord Jesus Christ, your Son, who lives and reigns with you in the unity of the Holy Spirit, one God, for ever and ever. St. John Chrysostom, born in Antioch about 347 A.D., was a great genius. His powerful eloquence earned him the surname of Chrysostom, or golden mouthed. With St. Athanasius, St. Gregory Nazianzen and St. Basil, he forms the group of the four great doctors of the Eastern Church. As Archbishop of Constantinople, his courageous stance against the vices of even the wealthy caused him to be exiled several times. As a result he died in 407, still in exile. In 1204 his body was brought to St. Peter's in Rome but was returned to the Orthodox on November 27, 2004 by Pope John Paul II. His silver and jewel-encrusted skull is now kept in the Vatopedi Monastery on Mount Athos in northern Greece, and is credited by Christians with miraculous healings. His right hand is also preserved on Mount Athos, and numerous smaller relics are scattered throughout the world. His feast in the Extraordinary Form of the Roman Rite is celebrated on January 27. John Chrysostom was the son of a Latin father and a Greek mother; his mother, Anthusa, was widowed at the age of twenty, soon after his birth. Putting aside all thought of remarriage, Anthusa gave all of her attention to her son: she gave him the best classical education of the day, and enrolled him as a catechumen when he was eighteen. He came under the influence of Meletius, patriarch of Antioch, who sent him to the monastic school of Diodore, then baptized him and ordained him lector. At this time, St. John Chrysostom decided to take his future into his own hands and became a monk-hermit, living in a cave, studying the Scriptures, and putting himself under the discipline of an old hermit named Hesychius. However, his health broke under this austere regimen and he returned to Antioch, was ordained a priest, and began his remarkable career as a preacher. During the next twelve years, he electrified Antioch with his fiery sermons, filled with a knowledge and an eloquence that were astonishing. It was during this period that he received the nickname Chrysostom, or golden mouth, for his words seemed to be pure gold. In 397, when the see of Constantinople became vacant, the Emperor Arcadius appointed John patriarch, and since it was feared that he would refuse the honor, he was lured to Constantinople and consecrated bishop of the city in 398. John found himself in a nest of political intrigue, fraud, extravagance, and naked ambition. He curbed expenses, gave lavishly to the poor, built hospitals, reformed the clergy, and restored monastic discipline. But his program of reform made him enemies, in particular the Empress Eudoxia and the Patriarch Theophilus of Alexandria. The city in turmoil, his life threatened, John was exiled by the emperor in the year 404. The papal envoys were imprisoned, and John — defended by the pope and ordered restored to his see — was sent further into exile, six hundred miles from Constantinople, across the Black Sea. Worn out and sick, he died of his hardships at Comana in Pontus. His last words were, "Glory to God for all things." Patron: Constantinople; epilepsy; orators; preachers. Symbols: Beehive; chalice on Bible; white dove; scroll or book; pen and inkhorn; bishop's mitre. Discuss and implement some ideas on how to follow this idea: "Family life becomes sanctified when parents carry out St. John Chrysostom's plea to make each home a family church." Cook special foods for this feast--Greek foods or foods with a "golden" color, such as honey. Imitate the patron of orators, learn how to give speeches, perhaps have a speech contest. St. John was a great Scripture scholar, and we should follow his encouragement of daily Bible reading and study. 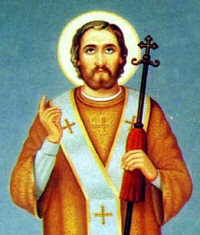 Read excerpts from St. John Chrysostom's writing to see why he was called "golden-mouthed." Learn more about the Eastern Rite churches. View some of the world's most famous icons.